When we gaze upon a scene or an image, our eyes are naturally drawn towards lines and shapes that lead from one point to another. Scientific studies that track eye movement have proved this, and as photographers we can use it to our advantage when composing a photo. Include strong lines and you can lead the eye towards your subject. It’s a simple but very powerful visual device. Look around and you’ll find leading lines everywhere in the landscape. There are man-made lines created by roads, walls and buildings, then there are natural lines like rivers, trees and the horizon. But if there’s one location that guarantees lines more than any other, it’s the coast. Not only is there the natural break between land and sea, there are also many man-made lines in piers, jetties and walkways that offer plenty of compositional gifts for those willing to look for them. 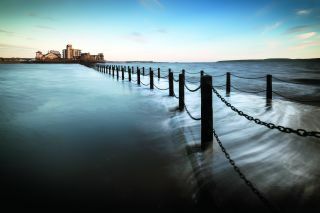 Leading lines are a useful way to simplify a composition, so it’s a visual device that goes hand in hand with other simplifying techniques like using a long exposure to blur water here. In this project, we’ll explore both techniques – how to use both leading lines and motion blur to strengthen your compositions. Neutral Density filters lessen the flow of light into your lens, enabling you to lower your shutter speed (making a tripod a must) for a blurred water effect. ND filters come in different strengths or ‘stops’, from subtle to almost opaque. The strength you need will depend on how slow you want to go. Each stop lets you double your shutter speed, so a three-stop ND reduces 1/60 sec to around 1/8 sec, while a 10-stopper takes 1/60 sec to 15 seconds. Stroll around any location and you’ll find plenty of lines to work with. For landscapes, the ideal line leads the eye from the foreground to a distant subject (a path or wall will do this), but interpreted more loosely, ‘leading lines’ could mean any line that draws the eye into the frame. Try framing lines so they spring from one of the corners, leading the eye towards background details. A wide-angle lens can help to exaggerate the perspective so that the line converges towards a distant point. We’ve used an AF-S Nikkor 16-35mm f/4G ED VR lens on a Nikon D800 here. Paths are a classic compositional device for drawing the eye. You can either position the path so that it comes into the frame from the side, or shoot from the centre for symmetrical lines that lead inwards. If you opt for the latter, make sure your camera is placed dead centre. If there aren’t any lines to hand, why not make your own? You could do it by positioning a piece of driftwood, shifting a few stones, or marking a line in the sand. Here the tracks of a beach buggy strengthen the composition and help to draw the eye towards the pier. Often you’ll see a strong line, but find it doesn’t lead anywhere interesting. Try including a person in the frame, positioned at the perfect point where the lines converge. You could either direct someone into place, or set up the shot and wait for a convenient passer-by. As well as solid lines, there are also lines that will appear and disappear throughout the day. When the tide came in here, the trails of water created their own lines and patterns. Fleeting lines can appear in cloud formations and shadows too, especially when the sun is low.